The Romans were accustomed to carve pairs of footprints on a stone with the inscription pro itu et reditu, "for the journey and return".They used them for protective rites on leaving for a journey and for thanksgiving for a safe return, when the traveller would place his or her feet in the footprints to mark the beginning or end of the undertaking. This same story is told of King Maelgwn of Gwynedd in North Wales who placed his feet in carved footprints to ensure his safe return from a pilgrimage to Rome. Footprints at Belmont, Londonderry Road, IrelandIn northern Europe, rock footprints were closely associated with Kingship or Chieftanship. Saxo Grammaticus notes that "The ancients, when they came to choose a King, stood on stones planted in the ground to proclaim their votes, signifying from the steadfastness of the stones that the deed would be lasting". Several reputed royal footprints survive in former Pictish power-places. Standing on a special stone is a link between the King and the land from which his people earned their food. Links with King Arthur and "The Sword in the Stone" may be relevant in this context of kingship, a right to power over his subjects and links with nature. A similar idea seems to be associated with the Moot hill or Boot Hill at Scone. for the latter name comes from an ancient tradition whereby emissaries swore fealty to their king by wearing the earth of their own lands in their foot-bindings or boots. The upper echelons of the clergy of the Celtic Church were drawn from the nobility, indeed even some Kings retired to become monks and eventually even saints, as in the case of King Constantine of Cornwall who retired to Govan on the Clyde in Scotland. This meant that the association of stone footprints was also made with the saints, bishops and others. The poet Spenser states that the custom amongst the Irish was to place the man who is to be chief upon a stone, always reserved for that purpose alone and located on a hill. Some of these had a footprint cut into them which was the size and shape of the candidates'. The oath was taken with the foot in the footprint, the individual swearing that as chief he would preserve all the ancient customs and respect the laws of royal inheritance. A Locus terribilis is a sacred place into which only a divine or sacred person could enter. Petrosomatoglyph foot prints for the ordination of kings would be an example, for it was believed that only the rightful king was able to use them for the purpose that they were intended. The Clickhimin Broch footprints on Shetland. 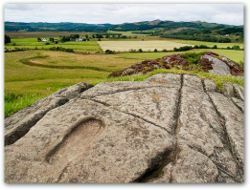 Carved footprint used in king-making ceremonies, Dunadd HillfortAmong Cup and ring marks on a boulder at Carnasserie, two miles from Kilmartin in Argyll are carved a pair of feet. At St. Mary's Church in Burwick, South Ronaldsay, Orkney is the Ladykirk Stone on which St. Magnus is said to have sailed over the Pentland Firth. It has two clear footprints cut into it. A pair of footprints is carved in a stone slab in a causeway at the Broch of Clickhimin (or Clickemin), Lerwick in Shetland. This site was occupied from about 1000 BC to AD 500. Two footprints are to be found at Dunadd (Dun Monaidh), ancient capital of Scot's Dál Riata. The completed one faces north and is accompanied by an image of a boar, rock-basins possibly cut for ceremonial ablutions and an ogham inscription. This footprint is said to be that of Oisin or Fergus Mor Mac Erca, the first King of Dalriada who died in AD 501. St. Columba is said to have installed Aidan as King on this rock. 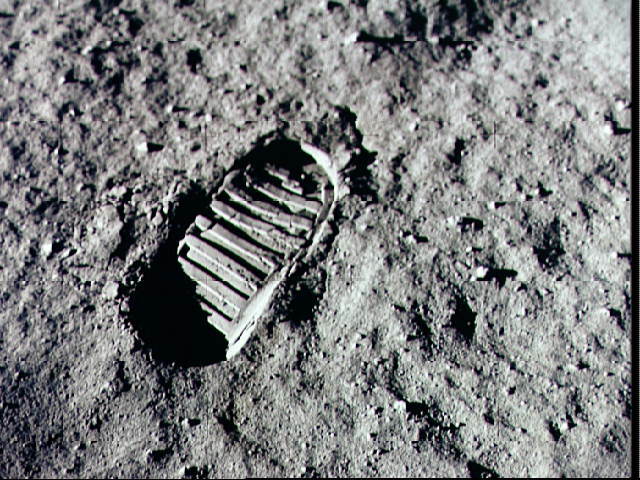 The best preserved footprint is 27 cm long, nearly 11 cm wide, 9 cm across at the heel and 2.5 cm deep; so large that it would fit a foot clothed in a shoe or boot. 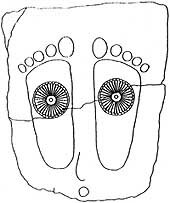 A second incomplete footprint is a lightly-pecked outline of a shod right foot, 24 cm long and 10 cm in maximum width. It has a pronounced taper to the heel; further internal peck-marks suggest that it was to have been hollowed out. It is on the same alignment as the other footprint. A crag near the chapel of Keil and St. Columba's Well, between Dunaverty Bay and Carskey in Kintyre, has two footprints carved at a place where St. Columba is reputed to have first set foot in Dalriada, Scotland. One is recent and the other genuinely old. 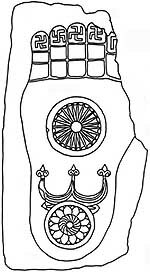 Kingship rituals may have been connected with this petrosomatoglyph. St. Columba's footprints are to be found at Southend in Argyll. Two examples exist in Angus. On Islay there was a Stone of Inauguration by Finlaggan. It was seven feet square and had footprints cut into it. When a chief of the Clan Donald was installed as the 'King of the Isles' he stood barefoot on the imprints on the stone, and with his father's stone in his hand was anointed King by the Bishop of Argyll and seven priests. During the ceremony an orator recited a list of his ancestors and he was proclaimed 'Macdonald, high prince of the seed of Conn'. The block was deliberately destroyed in the early seventeenth century. At Spittal, near Drymen, is a footprint which may be due to natural weathering. It is located at the western end of a long ridge of natural rock outcrop. A quarry for two millstones is nearby. At Craigmaddie Muir, Baldernock, East Dumbartonshire is the 'Auld Wives Lifts'. This is a complicated assemblage of carvings on a rock-platform. On the rock are serpent-like forms, crosses, cups and an impression of the right foot of an adult. At Dunino Den (56.28° N 02.76° W NO5311), near St Andrews in Fife is a footprint and a basin carved in the surface of a sandstone outcrop. A Celtic cross has been carved nearby, possibly as an attempt to Christianise the site. Close to St. Olann's Well at Coolineagh, near Coachford, County Cork, are the footprints of St. Olann on a boulder. In the garden of Belmont, on the Greencastle Road, about a mile from Londonderry there was in 1837 a block called St. Columba's Stone with two footprints on it. It may have been the inauguration stone of the Kings of Aileach, brought here by the local Chief of Derry. 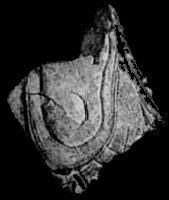 On the Clare Hills in Ireland, on the Gort to Feakle road in the townland of Drumandoora is the engraved outline or impression of a foot clothed by a sandal. On the Hill of Lech or previously Mullach Leaght, the Hill of the Stone, three miles south-west of Monaghan in Ireland was the inauguration stone of the Mac Mahons. It was used in 1595 and destroyed by a farm owner in 1809. The footprints and associated markings from Arzon Cromlech in Morbihan, BrittanyAt Clonmacnoise, King's County, Ireland, close to the Chapel of Clonfinlough there are several limestone boulders, one of which is called the Fairy's or Horseman's Stone. It has many cup-shaped hollows, croses, daggers, and a pair of human feet. At Templemore in County Londonderry is a slab named St. Columbkille's Stone. It has the imprint of two feet, each ten inches in length. traditionally it was the inauguration stone of the ancient Irish chieftains. At Slievenamon (The Mountain of the Women) at South Tipperary in Ireland is the rock that bears the footprints of Goll - 'the One-Eyed' - who made a giant leap across the valley to catch up with the hunt of the Fianna. On a rock formerly visible at the eastern end of Holyhead church in Anglesey was the footprint of St. Cybi. On a natural stone in Cornwall is a foot-shaped impression in a rock in the valley leading to the cliffs and coastal footpath nr Chapel Porth. It said to be the foot mark of Giant Bolster of St. Agnes legend. Just below the formation there used to be a Holy Well dedicated to St Agnes but it dried up due to the mining in the area. Footprints at North Yell, up Hena, in Shetland were thought to be lost, but were rediscovered in 1969 by the ordnance survey. The footprint, 12" by 4", is known locally as the "Wartie" and was used to wash in dew or rainwater and standing in it was supposed to get rid of warts. In legend it was made by a giant placing one foot here and the other on the Westing of Unst. In Bristol the giants Vincent and Goram dug the Avon gorge and left their footprints. Moso's Footprint in Samoa was made when the giant Moso stepped over to Samoa from Fiji, and the other footprint can be found on Viti Levu of Fiji. It is a 1m by 3m rock enclosure. At the foot of the Doa mountain in Vietnam, towards the west is a big rock. There are two human footprints on the rock. It is said that the footprints belonged to a giant who used to help the villagers with the construction of their houses. Unfortunately, one of the footprints has been damaged. At Arthur's Stone chambered tomb in Hereford and Worcester is a "cup mark" stone which bears the imprints of a giant's (or king's) elbow, left behind after he fell dead to the ground, killed by King Arthur. An unclothed footprint on a boulder at Trewithen in Chapeltoun, Ayrshire.At Poole Farm in Somerset a cist cover was found with footprints and cupmarks. 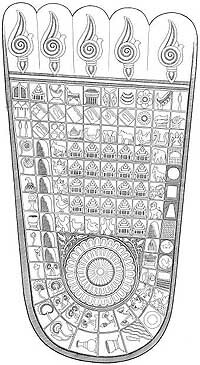 The decorated cist slab is displayed in Bristol Museum. Originally it was in position on the south side of the Pool Farm Cist, which was contained within a round barrow. Excavation revealed the cremated remains of a child and an adult. However, these carvings do have similarities with the Calderstones in Liverpool and others in Scandinavia. The footprinted "Calderstones" in Liverpool may have come from a Lancashire passage-grave. Sharkey sees a link of artistic influence between these and those at Petit-Mont in Brittany. Located at Smithills Hall, near Bolton in Lancashire is the impressed footprint at the bottom of a set of stairs of George Marsh, a Protestant martyr. In 1555 Marsh was interrogated at Smithills Hall and then taken to Boughton in Cheshire and burnt at the stake for the sake of his faith. 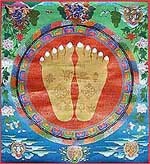 It is said that the footprint is a divine reminder of this unjust persecution and murder. Often impressions of hands are made in concrete to commemorate the famous as at Grauman's Chinese Theatre in Hollywood on pavement slabs or in wet concrete. Making footprints in stone of family members is part of New Age beliefs. footprint made by protestant martyr George Marsh. A passage-grave at Petit-Mont Arzon in Brittany contains a stone with a pair of feet, toes pointing upwards. Sharkey sees these carvings as coming from the same artistic tradition as those on the Calderstones. At Dol de Bretagne in Brittany are found the footprints of St. Michael on Mont Dol as well as a claw mark of the Devil. Near Minden in the Geismarwald on the Totenberg, an army leader who before a battle in the 30 years wars declared that he had as much chance of winning as he had of the stone becoming soft. It did and his foot and hand-prints are still there to be seen by all. At Rosenstein Castle on the Heuberg in the Remo Valley is a rock with the form of a beautiful human foot. On the mountain opposite, the Scheulberg is a similar imprint. In the Klatauer Kreis, close to Oberkamenz village on Hradekberg Mountain, stood a castle in which an arrogant daughter lived. She wore bread rolls as shoes and sank into the rock, as did the castle. One footprint can stll be seen. In 2003, a series of footprints, now known as the Ciampate del Diavolo, were discovered on the slopes of Roccamonfina, a dormant volcano about 35 miles from Naples. The tracks were left more than 325,000 years ago, during an eruption. They were preserved in the ash. Locals called the prints "devil's trails." Three primitive humans who scrambled down the volcano's slopes left their footprints fossilised in volcanic ash. One person left a track of 27 footprints in a zig-zag pattern, which probably made descent of the steep slope easier. Another track of 19 prints shows a gentle curve, but there are occasional palm-prints where the walker put a hand on the ground probably to avoid slipping. A third track of 10 evenly spaced prints forms a straight line. There are also two animal tracks, possibly made by big dogs or wolves. 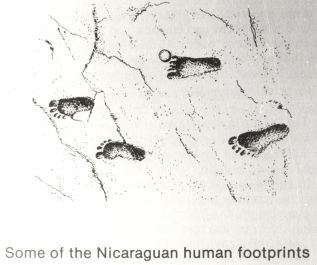 The human footprints are about 20 cm long and 10 cm wide. Using the average foot length to height ratio of 15 per cent, this suggests the people who made the tracks were only about 135 cm tall (4' 5"). If the ages of the tracks are confirmed, the footprints could have been made by Homo heidelbergensis, thought to have evolved more than 600,000 years ago and migrated to Europe from Africa. Many anthropologists believe H. heidelbergensis evolved into Neanderthals in Europe, but into modern humans, H. sapiens, in Africa. However, there is no consensus about the migration patterns of our primitive ancestors. The Italian fossils are much younger than the oldest known hominid footprints - those near Olduvai Gorge in Tanzania are more than 3.7 million years old. They were probably made by two individuals of the distant ancestral species Australopithecus afarensis, of which the famous fossil skeleton Lucy was a member. However, the devils' trails may be the earliest known footprints of a Homo species, which some consider to be the first true humans. 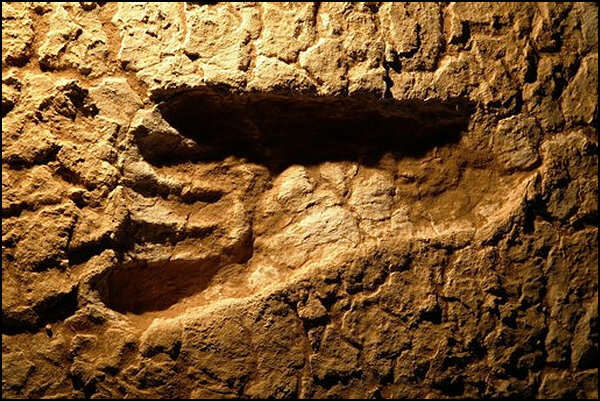 Leslie Aiello, an anthropologist at University College London, thinks the people who left the footprints seem surprisingly small for H. heidelbergensis adults. Boxgrove man, another H. heidelbergenesis individual whose tibia was found in England in 1993, seems to have been more than 180 cm tall (six feet). The Italian footprints could have been made by children, suggests Aiello. A set of Jesus's footprints, according to legend, are preserved at the Church of Domine Quo Vadis outside Rome. It is at this spot that Saint Peter traditionally met Jesus while the former was fleeing persecution in Rome. According to the apocryphal Acts of Peter, Peter asked Jesus, Domine, quo vadis? (Lord, where are you going?) Jesus answered Eo Romam iterum crucifigi (I am going to Rome to be crucified anew). There has been a sanctuary on the spot since the 9th century, but the current church is from 1637. The current façade was added in the 17th century. 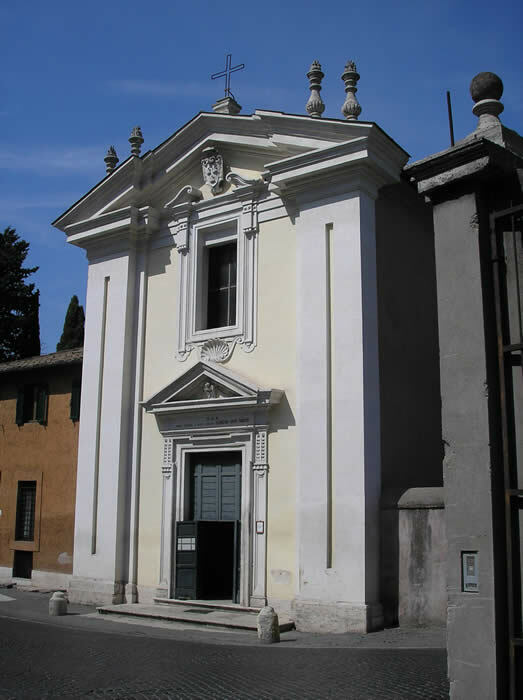 The real name of the church, very little known, indeed, is Chiesa di Santa Maria in Palmis, where palmis refers to the soles of Jesus' feet. At the Chapel of the Ascension in Jerusalem, there are a pair of footprints reputed to be those of Jesus Christ made at the time of his Ascension into heaven. A set of Jesus's footprints, according to legend, are preserved at the Church of Domine Quo Vadis outside of Rome. 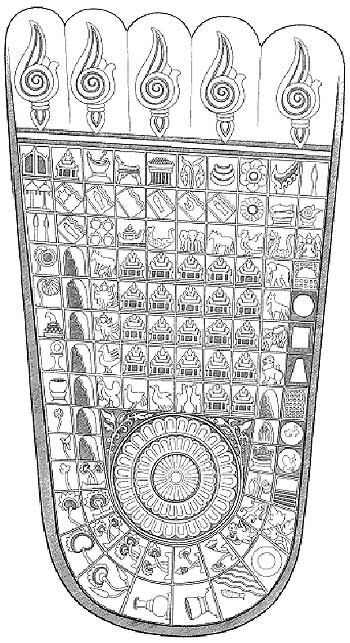 In Buddhist symbolism, a Buddhapada (footprint of the Buddha) with Dharmacakra and Triratna symbols from the 1st century, is to be found at Gandhâra, Northern Pakistan. 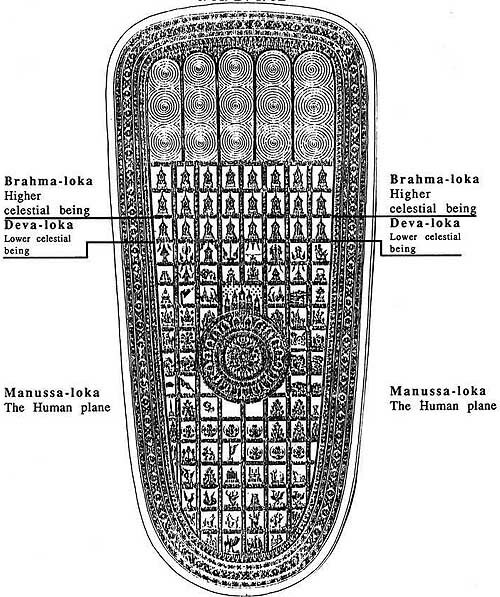 These footprints are associated with figures such as ships, shields and people.On Sri Pada, or Adam's Peak, a mountain in Sri Lanka is a footprint mark said by Buddhists to be that of the left foot of the Buddha, the right footprint being in a city about 150 kilometres distant, or at Phra Sat in Thailand. 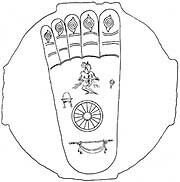 Tamil Hindus consider it to be the footprint of Shiva. Some Muslims and Christians ascribe it to Adam where Adam the 'first ancestor' is said to have set foot as he was exiled from the Garden of Eden. Sometimes Christians ascribe it to Saint Thomas, the 'Apostle of India'. 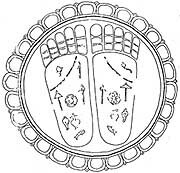 Footprints of the Buddha also exist in Afghanistan, Bhutan, Cambodia, China, India, Japan, Korea, Laos, Malaysia, the Maldives, Pakistan, Singapore, and Burma. The St. Victor's Petroglyphs in Provincial Park, Saskatchewan, Canada feature human footprints. A tradition of body-part impressions at holy wells, rivers and beneath waterfalls comes from the fact that Celtic monks or culdees often prayed in such places, continuing the veneration of the Druid's for sacred water. Folk belief ascribes healing powers to waters taken from these holy impressions and the this water was used to cure sickness, wounds and sores, as well as preventing or curing sickness in animals such as cattle. At Llangynnlo in Wales are Olgliniau Cynllo, the knee prints of King Cynllo at prayer. At Troedraur in Dyfed, South Wales are the knee-marks of St. Gwyndaf Hen impressed on a flat rock in the bed of the River Ceri. These are 'pot holes' or rock-cut basins made by the grinding effect of stone in the river currents to the sceptics. St Cynwyl in the river at Caio in Wales. St. Beuno at Llanaelhaiarn in Wales. At Arthur's Stone chambered tomb in Hereford & Worcester is a 'cup mark' stone which bears the imprints of King Arthur's knees left behind after he prayed to God in thanks for victory over a giant (or king) whom he had killed and whose tomb this is. At Llanllyfni in Wales are the knee prints of St. Gredfyw. John O'Donovan in his Ordnance Survey Letters of 1840 tells the story of Saint Moling crossing a small hill in the County Wexford district when an evil spirit annoyed him. He knelt on a rock to curse the spirit, leaving the impression of his knees on the stone. While there is no account of the stone today, it is said that the incident gave the name to the townsland Cloch na Mallacht, i.e. "the stones of the curses; linking the episode to bullaun stones which often contain cursing stones. were and what we were doing at that time. Unfortunately, there was no one in a good position to photograph the moment. him I didn't know. He said, "Well!" We agreed that there were some details we just couldn't remember from our missions. 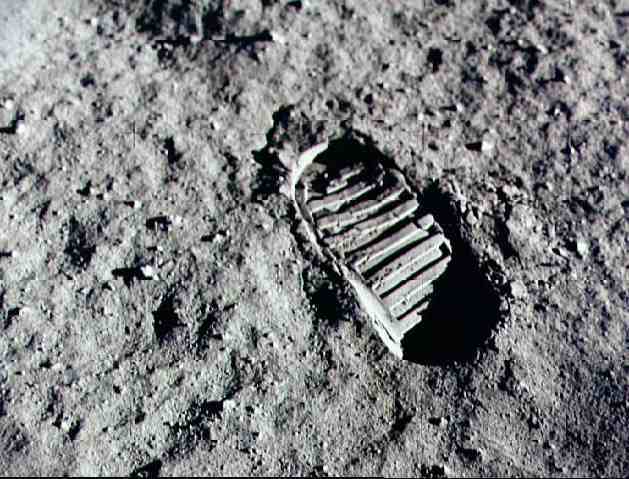 make some technical observations about the historic footprint. 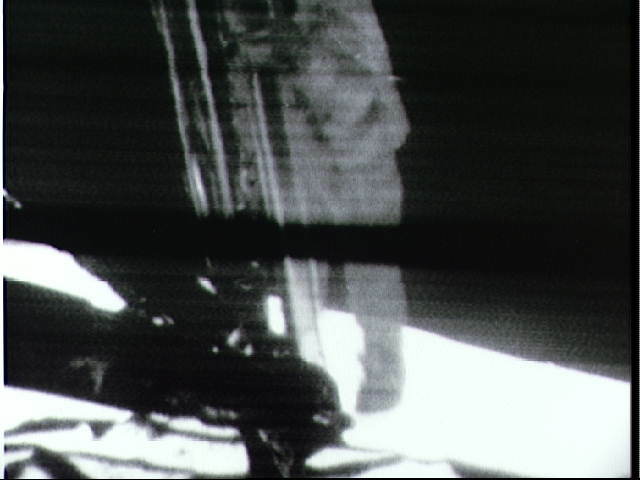 leap for humankind than the one made by Neil Armstrong and all the people when helped him make that leap on July 20, 1969. 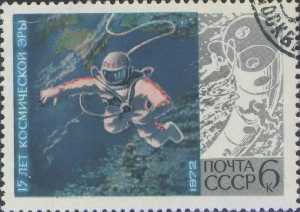 An expandable airlock attached to the reentry module allowed Lietenant Colonel Leonov to exit the capsule without caussing a loss of air in the descent module. 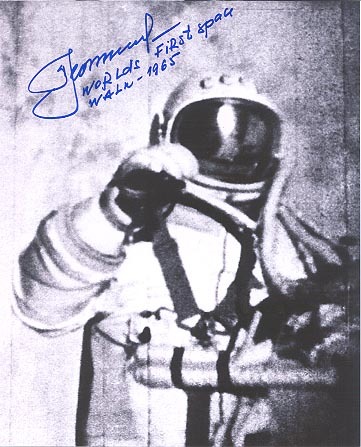 Leonov was in the open airlock for about ten minutes, and he dangled from the end of a 5.35m tether outside thevehicle for another ten minutes before terminating history's first space walk. 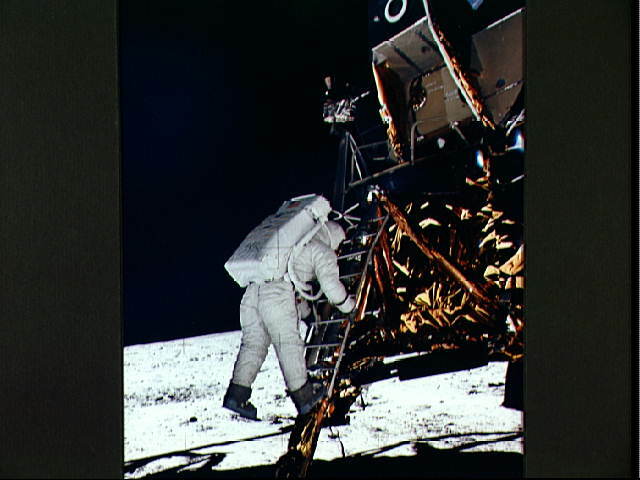 The EVA was recorded by a TV camera mounted on the reserve retrorocket assembly and a film camera mounted on the airlock. 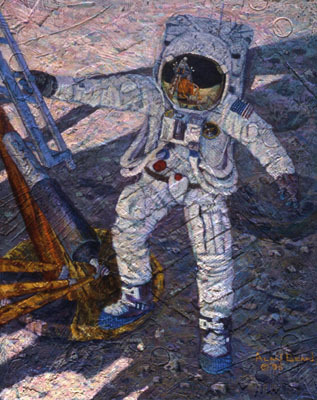 The suit was very cumbersome, and Leonov experienced a disorienting euphoria while outside of the vehicle. The automatic reentry system failed and they were forced to make a manual descent. The capsule missed the scheduled landing zone by some hundred kilometers, creating a delay of 24 hours before the crew were reached. Jutting sharply skyward from the lush jungles of southwestern Sri Lanka is the 7362 foot (2243 meter) peak of Sri Pada, the 'Holy Footprint'. Also called Adam’s Peak, the mountain has the unique distinction of being sacred to the followers of four of the world's major religions: Hinduism, Buddhism, Christianity and Islam. Long before the development of these religions, however, the mountain was worshipped by the aboriginal inhabitants of Sri Lanka, the Veddas. Their name for the peak was Samanala Kanda; Saman being one of the four guardian deities of the island. For Hindus, the name of the mountain is Sivan Adi Padham, because it was the world-creative dance of the god Shiva that left the giant footprint (5 feet 7 inches by 2 feet 6 inches). According to Buddhist traditions from as early as 300 BC, the real print is actually beneath this larger marking. 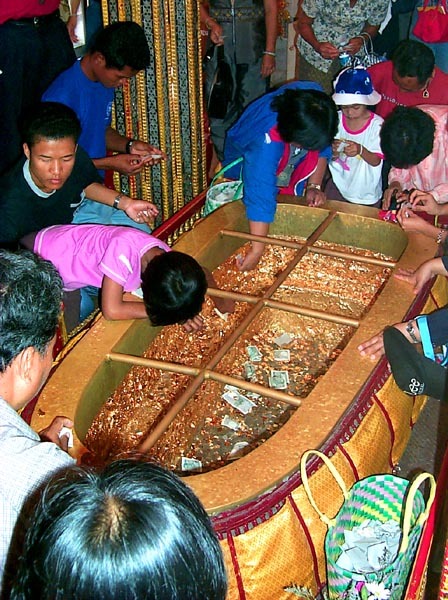 Imprinted on a huge sapphire, it was left by the Buddha during the third and final of his legendary visits to Sri Lanka. 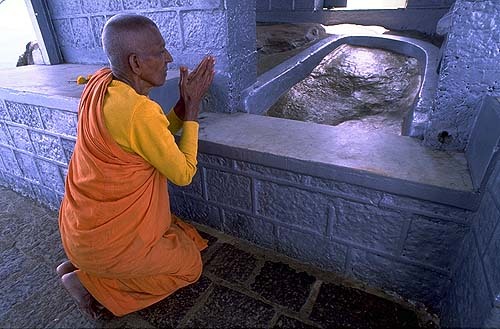 When Portuguese Christians came to the island in the 16th century they claimed the impression to be the footprint of St. Thomas who, according to legend, first brought Christianity to Sri Lanka. And finally, the Arabs record it as being the solitary footprint of Adam where he stood for a thousand years of penance on one foot. An Arab tradition tells that when Adam was expelled from heaven, God put him on the peak to make the shock less terrible - Ceylon being that place on earth closest to and most like heaven. The mountain is more easily seen from the sea than from land, and also more impressive. 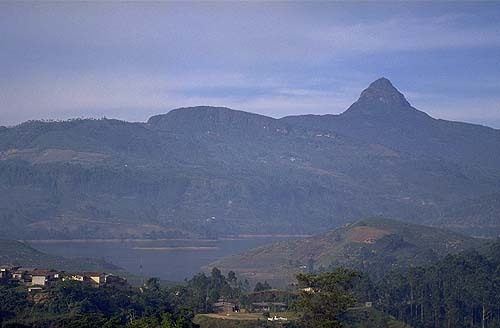 Early Arab seafarers fascinated with the pyramidal peak wrote of it as "the highest mountain in the world" (it is not even the highest in Sri Lanka), and "visible from three days sail". The ancient Sinhalese also believed it to be of great height and a native legend tells "from Seyllan to Paradise is forty miles, and the sound of the fountains of Paradise is heard here". Visited by many early world travelers, among them the Arab Ibn Batuta (1304-1368) and the Venetian Marco Polo (1254-1324), Adam’s Peak attained a legendary status as a mystic pilgrimage destination. Today the pilgrimage season commences in December and continues until the beginning of the monsoon rains in April (from May to October the mountain is obscurred by clouds). Certain parts of the path leading up the mountain are extremely steep and the climbing chains secured in these sections are said to have been placed by Alexander the Great (365-323 BC), though there is no evidence that he made it this far south on his Asia travels. Atop the peak is an oblong platform (74 x 24 feet) where stands a small Buddhist temple and the shrine of Saman with the strange footprint. Votive offerings are made here, especially of a coil of silver as long as the donor is tall, for recovery from sickness; and rain-water taken from the footprint is known to have a wonderful healing power. Adam’s Peak is also called Samanalakande or the 'butterfly mountain' because of the myriads of small butterflies that fly from all over the island to die upon the sacred mountain. Creationists claim that humans and dinosaurs lived together in Texas just before Noah's flood by citing alleged human footprints found side-by-side with those of dinosaurs in the Cretaceous limestone of the Paluxy River near Glen Rose, Texas. An investigation was conducted to determine if this claim were true. Findings of this investigation are reported and discussed in the papers included in this publication. They are: "Tracking Those Incredible Creationists" (R. J. Hastings), an investigative chronology of the Glen Rose creationists excavations from 1982 to the present; "Foot Notes of an Anatomist" (L. R. Godfrey), which examines the human and dinosaur footprints at the site; "Mantracks? The Fossils Say No!" (J. R. Cole, L. R. Godfrey, and S. D. Schafersman); "If I Had a Hammer" and "It Ain't Necessarily So: Giants and Biblical Literalism" (J. R. Cole). It is pointed out that the "mantracks" (the term given by creationists to the elongated channels or depressions found in rock) could have been formed by numerous mechanisms other than human involvement. 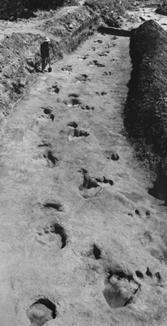 In 1930 Roland T. Bird, field explorer for the American Museum, reported 15-20 inch long "clearly defined" human footprints with dinosaur tracks. even cut in half and sawed across the toes. The lamination line was distorted by the mud squeezing up between the toes. Before 1922 (or on 25 January 1927, according to some versions of the story), an amateur geologist and Fortean, John T Raid or Reid (or, according to the other version, Alfred E Knapp), found a fossil in the Triassic limestone of Fisher Canyon, Pershing County, Nevada, as reported by W H Ballou in the New York Sunday American of 8 October 1922. The stratum is conventionally dated to 225 million years ago (although some give a date of 5 million years or state that it was from coal layers 15 million years old). However, the accounts state that it was found lying among a pile of loose rocks, fossil side uppermost, on the side of a low hill. 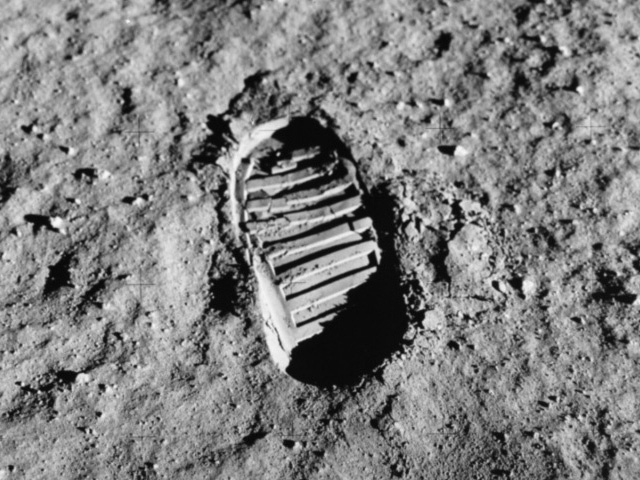 It showed a shoe print, complete with a broken off heel (Knapp is quoted as saying that “it is a layer from the heel of a shoe which had been pulled up from the balance of the heel by suction, the rock being in a plastic state at the time”). Microscopic photography carried out later at the Rockefeller Institute (or Foundation, according to the variant account) confirmed that it was indeed a heel and that the fossil seemed to show the presence of two rows of crewel, 8.5 mm (??) apart, with the twists in the thread clearly visible. Minute crystals of mercury sulphide confirmed the fossil’s antiquity. According to Samuel Hubbard of the Museum of Archaeology in Oakland, California, “Today’s people on the earth are not yet able to make this kind of shoe. Facing this kind of evidence indicates that at the time of suspected uncivilized arthropods, millions of years ago, people with high intelligence appear to have existed…”. The version according to which the fossil was discovered by Raid quotes him as saying that “the minutest detail of thread twist and warp, proving that the shoe sole... is strictly the handiwork of man”. It is also claimed that the right side appeared more worn than the left, indicating that it was a shoe worn on the right foot. Even supporters of the fossil admit that most geologists who have examined the rock have concluded that it is a natural formation, even though it closely resembles a shoe print. However, the problems are even greater. Why are there two separate accounts of the same discovery, made at different dates and by different people? Why is there no agreement about the date and character of the rock in which it was found? What about the expert opinion of Samuel Hubbard? He is quoted elsewhere on this site as giving an opinion on an alleged Tyrannosaurus pictogram from Arizona. Although on that occasion, he worked as Curator of Archaeology for the Museum of Natural History in Oakland, California, this time, he works for the Museum of Archaeology. He is also quoted in 1923 as an authority for the genuineness of the Lady of the Woods in Crater National Park, saying that it might be the cast of a woman engulfed by a flow of mud that had poured down the side of Mount Mazama. The fact that it had been carved in 1917 by Dr Earl Russell Bush (and publicly acknowledged as such in 1921) does not inspire confidence in Hubbard’s investigative abilities. Moreover, another quote from him about this discovery rather gives the game away: “There are whole races of primitive men on earth today, utterly incapable of sewing that moccasin. What becomes of the Darwinian theory in the face of this evidence that there were intelligent men on earth millions of years before apes were supposed to have evolved?” This makes it clear that Hubbard was not a dispassionate investigator, but one on the side of the creationists at a time when the debate in the USA was at its fiercest. Given the inconsistencies in the story, it is difficult to take seriously any of the claims being made for the ‘fossil’; indeed, there is little evidence that it is indeed a ‘fossil’ rather than a product of erosion. It is also troubling that there are two incompatible versions of the story, both complete with circumstantial details; one or the other has to be false, if not both (Thomas, 1971, p.24). . In 1897, the Los Angeles Herald revealed that laborers had discovered a fossil shoe print in solid rock. The imprint was that of a shoe with a high narrow heel and a broad flat sole. It was so clear, in the fine grained shale in which it was found, that it looked as though the owner had unwittingly put his right foot into soft mud but a day or two ago. Sandal or moccasin prints have also been seen in the gypsum of the White Sands in New Mexico. Ellis Wright in 1932 found tracks of human form but 22 inches long. Some later tracks were accompanied by marks suggestive of the use of some sort of support like a walking stick by one of the antediluvian beings. The White Sands were laid down as an ancient inland sea gradually dried up around the time of the demise of the dinosaurs. A highly detailed footprint, thought to be that of a young boy, was found fossilized in clay stone on the east bank of the Connecticut River, just south of Hadley, Massachusetts, in 1852. Also preserved in the clay were the tracks of birds, four footed animals, and snails. Even the impressions of raindrops were preserved and were not "totally obliterated by the foot of the boy. 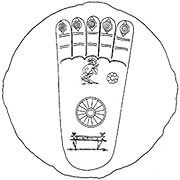 All the striae and lines on the sole of the foot appear distinctly..." Alongside the boys footprint were those of a crow, and the pattern of skin of the birds foot could be clearly seen. The bed of stone bearing these imprints line under some 20 feet of alluvial sand until it was exposed by the streams (The American Journal of Science and Arts, 2:19:391-96, May1855). 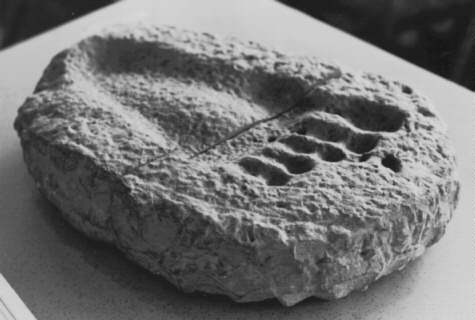 A large stone bearing the perfect imprint of a human foot 14 1/2 inches long was shown to members of the Ohio State Academy of science in 1896. The stone slab had been dug from the ground in a hill four miles north of Parkersburg, West Virginia some 20 years earlier (The American Anthropologist, February 1896, p.66). At the summit of Big Hill in the Cumberland Mountains in Jackson County, Kentucky, is a layer of carboniferous sandstone. In the 1880's it was crossed by a wagon trail that in time broke up the surface of the rock. When the resulting debris was cleared away, a series of tracks was discovered in this carboniferous layer about 300 million years old. There were imprints of a bear, something resembling a large horse, and two "tracks of a human being, good sized, toes well spread, and very distinctly marked." The prints were examined by Professor J.F.Brown of Berea College, Kentucky (The American Antiquarian, 7:39, January 1885). pressure from the human foot, and in no way could have been duplicated by carving. The rock in which the prints were discovered was estimated to be 250 million years old. In recent years, the prints have been destroyed by "vandals." (Brad Steiger, Mysteries of Time and Space, pp.6-7). A carnival of horses, bears, turkeys, and six toed humans left their tracks in what is now solid stone near the headwaters of the Tennessee River, a few miles south of Braystow, North Carolina. According to Josiah Priest, a 19th century writer on antiquities, the bizarre humanoid tracks included one of a giant - 16 inches long, 13 inches across at the toes, and 5 inches wide at the ball of the heel (Josiah Priest, American Antiquities, p.150). flattened in a manner that happens to those who have been habituated to go a great length of time without shoes. Notwithstanding this circumstance, the prints are strikingly natural, exhibiting every muscular impression, and the swell of the heels and the toes, with a precision and faithfulness to nature, which I have not been able to copy, with perfect exactness, in the present drawing.... Every appearance will warrant the conclusion that these impressions were made at a time when the rock was soft enough to receive them by pressure, and that the marks and features of the feet are natural and genuine." In the geologic scheme of things, this limestone hardened about 270 million years ago. Both the rock and the prints in it were said to show the same evidence of wear and aging (The American Journal of Science and Arts, 1:5:223-312, 1822). On the north slope of a boulder strewn hill near the mouth of the Little Cheyenne River, South Dakota, lies the flat, dazzling white rock of magnesian limestone, which scientists say was laid down and hardened over 100 million years ago. On it are three prints of moccasined feet. In size they seem to be those of a woman or adolescent, and to judge the length of the stride (4 1/2 and 5 1/2 feet) the person who made them was running. In one of the prints, the impression made by the heel is deeper than that made by the ball of the foot, which again lends credence to the theory that whoever made the tracks was running. The depth of the tracks varies from 1/2 an inch to 1 inch. All three clearly show the instep and faint toe impressions, and all show the same amount of weathering as the unmarked surface of the surrounding stone. According to an interview which was obtained with Mr. Le Beau, who had lived in the area for over 26 years, local Indians knew nothing of the origin of the footsteps, but viewed the stone as a "medicine rock." (William R. Corliss, Ancient Man: A Handbook of Puzzling Artifacts, p.649). between strides of about 5 feet and a separation in width of 2 feet. inches. There is no doubt that the tracks were made by living creatures. One suggestion is that they were made in the 1850's by US Army camels, a more accepted view is that they are 10,000 years old, and were made by an extinct animal such as a Mammoth or native camel. But the spacing of the footprints suggests a two legged creature. The mysterious tracks are now protected by archaeologists (U.S. Army Report, 1981). James Madsen said; "There were no men 600 million years ago. Neither were their monkeys or ground sloths to make pseudo human tracks. What man thing could have possibly have been walking around on this planet before vertebrates even evolved?" Madsen then went on to say that the fossil must have been formed through natural processes, though what kind he was unable to suggest. Dr. Jesse Jennings, of the universities anthropology department , guessed (rather boldly, considering the absence of any supporting visual evidence) that the print might have been made by one large trilobite coming to rest on three smaller ones. On July 20th, 1968, the Antelope Spring site was examined by Dr. Clifford Burdick, a consulting geologist from Tucson, Arizona, who soon found the impression of a child's foot in a bed of shale. "The impression" he said" was about 6 inches long, with the toes spreading, as if the child had never yet worn shoes, which compress the toes. There does not appear to be much of an arch, and the big toe is not prominent." The print was shown to two geologists and one paleontologist. One of the geologist agreed that it appeared to be that of a human being, but he paleontologist said that no biological agent had been involved. Dr. Burdick stuck to his guns: "The rock chanced to fracture along the front of the toes before the fossil footprint was found. On cross section the fabric of the rock stands out in fine laminations, or bedding planes. Where the toes pressed into the soft material, the laminations were bowed downward from the horizontal, indicating a weight that had been pressed into the mud." 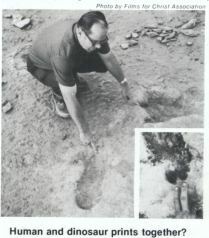 In August 1968 Mr. Dean Bitter, an educator in the Salt Lake City public school system, claimed to have found two more footprints in the Antelope Springs area. According to Dr. Cook, no trilobites were injured in these footfalls, but a small trilobite was found near the prints in the same rock, indicating that the small sea creature and the sandaled traveler might have been contemporaries (Bible Science Newsletter, August-September 1969, Royal Research Society Quarterly, December 1968; CRSQ, 1968, 5:3, p.97). In 1882 huge footprints, strongly resembling those of a human wearing shoes, were found in a layer of sandstone in the yard of the state prison near Carson City, Nevada, during digging operations. The prints were between 18 and 20 inches long and approximately 8 inches wide. The stride was about 3 feet and the distance between the left and right tracks, the straddle, was about 19 inches. Numerous other tracks resembling those of deer, horses, elephants and wolves were found in the same layer of sandstone. Since the size of the prints and the age of the rock at the layer they were discovered (2 to 3 million years old) argued against a human or even a hominid origin, the prints were ascribed to a more acceptable origin, the tracks of a giant ground sloth. It is thought that these animals could stand upright, but only by using their tails for additional support. However, no tail track was found at this site. It was also suggested that perhaps the animal was walking on four feet, and that its rear legs were landing exactly in the tracks left by its front feet, thereby creating the impression of a biped. But this fails to account for the fact that the tracks show no toe marks (The American Journal of Science 3:26:139-40, July-December 1883). The footprint of a human being, apparently fleeing toward the Gediz River from a volcanic eruption, was discovered in volcanic ash during the construction of a dam near Demirkopru, Turkey, in 1970. The age of the ash was determined to be 250,000 years old by the Turkish Mineral Research and Exploration Institute in Ankara, and the print was pronounced human by the National Laboratory of Forensic Science in Sweden. If so, whoever made the print was an antecedent of Neanderthal man (Nature, 254:553, April 17th, 1975). Herculaneum, Missouri, and on rocks near Kingston, New York (CRSQ , 1970, 7:4, p.205). still partly covered by higher sandstone strata. Other prints have been reported in nearby areas, but further information is lacking (CRSQ , 1970, 7:4, p.207). feet were perfectly modern the age was reduced to older than 50,000 years. The only geologist to visit the scene at the initial discovery also found traces of domesticated dogs and horses with the prints - an impossible situation to resolve. Polished stone artifacts and projectile points were also discovered. 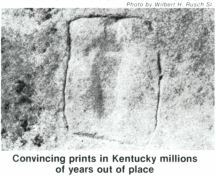 The prints are now dated at about 3000 B.C. on the basis of C14 tests, but this forces a considerable number of catastrophic events in a very short time period. Since various fossilized animal bones and mastodon remains have been found in strata above the human prints, the conclusion then is forced that the mastodon lived into very recent times. 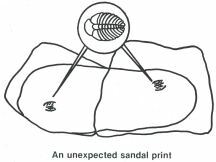 Near the city of San Raphael other human and animal tracks were found, including a sandal print which is now in the museum at Harvard (Victoria Institute , 1886, 22:148-152; Archaeology , 26 [April 1973], 146-147). 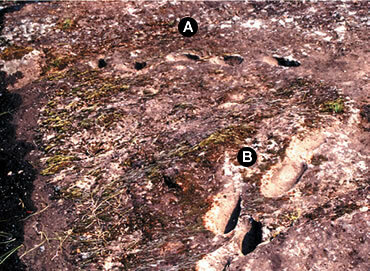 The 457 footprints found in Mungo National Park in western New South Wales state is the largest collection of Ice Age footprints in the world and the oldest in Australia. In this photo released by the Environment Ministry, a footprint believed to be that of a man is shown in the Willandra Lakes district in western New South Wales of Australia, Dec. 14, 2005. Hundreds of human footprints dating back to the last Ice Age have been found in the remote Australian Outback, an official and media reported Thursday, Dec. 22, 2005. The prints were made in moist clay near the Willandra Lakes 19,000 to 23,000 years ago, the newspaper reported ahead of archeologists' report on the find to be published in the Journal of Human Evolution. State Environment Minister Bob Debus said the site showed a large group of people walking and interacting. "We see children running between the tracks of their parents; the children running in meandering circles as their parents travel in direct lines. It's a most extraordinary snapshot of a moment or several moments in the life of Aboriginal people living on the edge of the lake in western New South Wales 20,000 years ago." The first print was reported by a local Aboriginal woman two years ago and a team of archaeologists led by Bond University archaeologist Steve Webb uncovered more than 450. The white, palatial house of the business dynasty, Birla (Gandhi Smriti), stands just a couple of kilometres from Connought Place, a well-known tourist attraction in the greenest area of Delhi. This is the place where Gandhi spent the last 144 dramatic days of his life. The museum in the building reflects his life and death. In the park, the visitor can follow the steps of his last walk. From the door of the plain, white painted room with a glass veranda where he lived there are cement footprints across the park to where he was murdered. Here the visitors go barefoot and silent.